I have to start this review by saying I’m a little biased due to the fact that Mr Behemoth and I had our first ‘proper’ date (as in, sans the friends that had set us up) at Cookie – so I view the place fondly based on this alone. It’s one of Mr B’s favourite restaurants. We’ve been many more times since then (and I had been a few times before then too -having the banquet at a friend’s going away was particularly memorable as I got to try many many more dishes) and now as I’m blogging my dining experiences, you get photos! 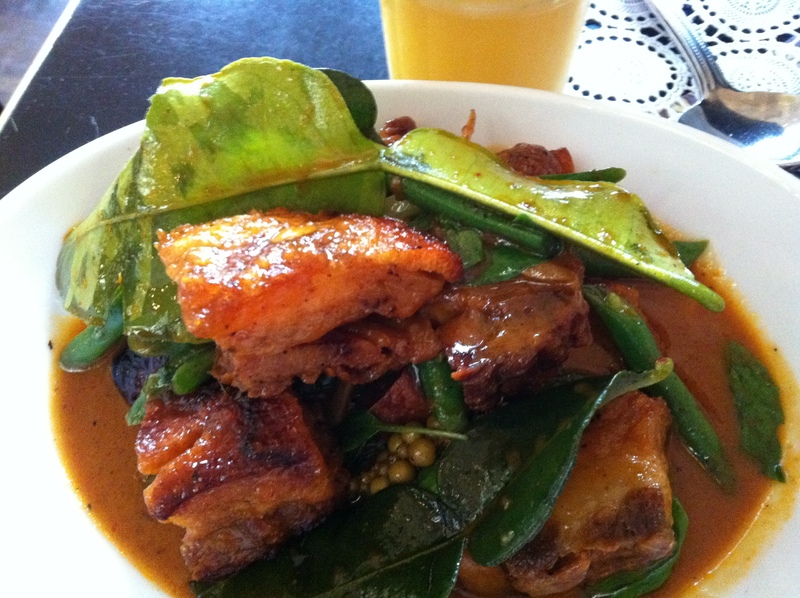 On this occasion, we ordered my favourite dish off the menu (probably because it’s the most bad for you) – the stir fried pork belly with red curry, green peppercorns, kaffir lime and green beans. I really, really like this dish – although it’s fatty as, the skin crackles perfectly, the curry is hot and spicy but not unbearably fiery, and the green beans are a great accompaniment. The green peppercorns – well, I can take ’em or leave ’em. They add a certain interest to the look of the dish. One time Mr B and I tried eating them – blergh, do not recommend – in our defence we were a few pints of beer in. We also ordered Mr B’s default Thai order, green curry chicken, which at Cookie comes in the form of chicken and corn dumplings (I was going to call them cornballs then, heh). It also has baby sweet corns, and giant slices of chilli. The curry is spicy and full flavoured but I can’t help but feel the dumplings are a bit dry and less flavoursome – I would have preferred chunks of chicken instead. There’s also a lot of sauce relative to lumpy bits, which would have been fine had we not been given a serving of rice for one person. I think this was a mistake because we ordered rice for two; anyway we had to get up and order more rice, which came as the standard 2-person serving so late into the meal that it made no difference anyway. That's a red chilli lurking. On another occasion (our anniversary) I ordered the duck jungle curry, only to be queried by the waiter: “You think you can handle the heat?” I said yes, proudly, and then spent the rest of the meal handling it as best I could so as not to lose face (with the waiter, not Mr B – he knows what he’s gotten himself into). We’ve also ordered the drunken noodles with minced pork in the past – not a star on its own but a worthy side dish – and eggnet salad with minced chicken, spinach and cashews which was delicious. Cookie’s menu is mid-priced, not cheap Asian eats, and service can be a little perfunctory with accompanying rice mishaps – but you can be pretty assured that the dishes aren’t going to be misfires. Colonel Tan’s is the sister ship at Revolver, and does pretty much the same for cheaper – hot tip if you’re in the Chapel Street area! Epic amounts of bloggers have already reviewed Cookie but some of the best are: Melbourne Gastronome, who found everything a bit too spicy (she did order the aforementioned duck jungle curry though); and Melbourne Culinary Journal found everything a bit expensive (although did love the pork belly, that dish is such a winner). I hear Sydney does Thai food a lot better than Melbourne, but that doesn’t mean our city doesn’t have some gems. Talk to me Melbourne! 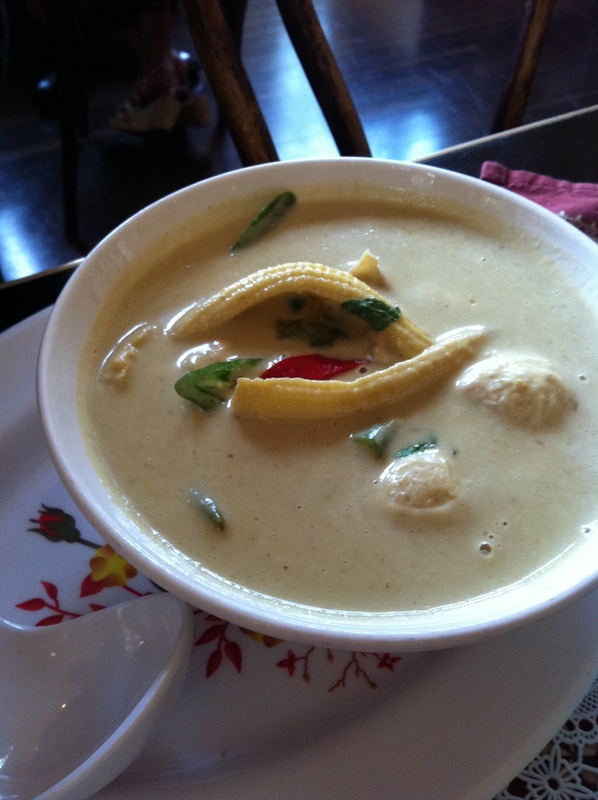 Please leave a comment below and tell me: Where’s your favourite Thai restaurant? Tags: green chicken curry, kaffir lime, loud, pork belly, thai. Bookmark the permalink.